NASA's Opportunity Mars rover has come across an interesting object -- perhaps a meteorite sitting out in the open at Meridiani Planum. Initial data taken by the robot's Mini-Thermal Emission Spectrometer (Mini-TES) is suggestive that the odd-looking "rock" is made of metal. The curious-looking object stands out in the parking-lot like landscape of Meridiani Planum. "We're curious about it too. We have Mini-TES data on it now, and they suggest that it may actually be made of metal," said Steve Squyres, lead scientist on the Mars Exploration Rover mission from Cornell University. "So we are beginning to suspect that it may be a meteorite. I stress that this is very preliminary! ", Squyres told SPACE.com. Opportunity has been busy at work inspecting entry debris -- hardware that fell to Mars during the robot's entry, descent, and landing over a year ago. Not too distant from the debris field, the odd-looking rock sits alone atop the sandy terrain. Squyres cautioned that it is too early to identify the rock as a meteorite. 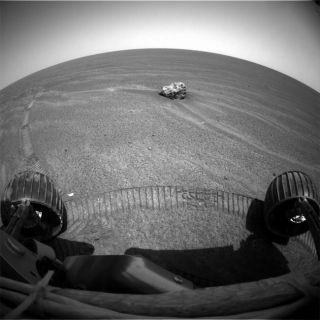 The next step by rover scientists is to carefully examine the object with Opportunity's Instrument Deployment Device, or IDD. This robot arm is tipped with scientific instruments. Once extended out to the object, the arm-mounted devices can study the object's structure in great detail. The instruments on the IDD are the Microscopic Imager, the M?ssbauer Spectrometer, the Alpha Particle X-Ray Spectrometer, and a Rock Abrasion Tool. "We're going to look at it carefully with the IDD instruments next, and that should enable us to determine for sure what it is," Squyres said.